Cob building dates back hundreds of years ago, and cob houses built over 500 years ago in Europe are still inhabited to this day. That’s pretty dang impressive considering the simple nature and composition of the material: buckets of wet clay and sand are mixed by foot (or by horse, oxen, concrete mixer, or even Bobcat excavators) and then combined with straw to produce a sticky, malleable material that can be rolled into palm-sized loaves (or “cobs”, which is where the name originated) and then laid onto a foundation and sculpted by hand to build thick and massive cob walls. Cob structures are monolithic: layers of material are worked together to produce one massive structure, compared to something like adobe, which is typically made into forms that can be stacked like bricks. When cob dries, it resembles rock or concrete in its hardness. With a nice thick coat of plaster, cob can withstand significant weathering before it starts to (slowly) wear away. Exterior cob walls can range anywhere from over one to three feet thick: the thicker they are, the more heat they are capable of storing. You see, cob is not very insulative, compared to say, straw bale buildings. Cob has better “thermal mass“, which means it is capable of capturing and storing large amounts of heat. The best way to do this? Stick a flue pipe through a cob bench and heat up your furniture with a rocket stove. The main components of cob building – sand, clay, and straw, come directly from the earth, oftentimes right beneath our feet. (For example: all of the clay I am using in my cob house comes straight from the soil on the property here at Dancing Rabbit Ecovillage.) Therefore, cob has very low embodied energy, meaning there is little energy wasted in manufacturing and transporting materials over great distances. Call it a “local and organic” kind of building technique. 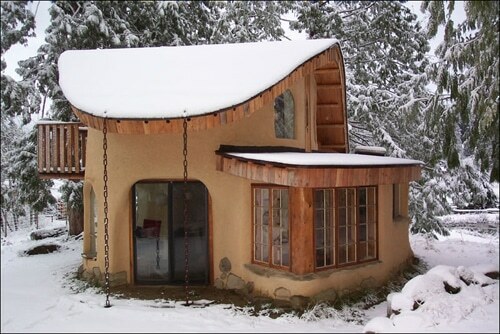 Not only that, but it’s beautiful, too: cob lends itself to smooth and curvy home design, with rounded doorways and curved walls. Shelves and storage nooks can be built directly into walls. Fortunately, I live in Missouri, where there are no building codes to prevent me from building with cob. Unfortunately, you can’t just go ahead and start building your own cob house without a bit of meddlesome bureaucracy in most states. However, there are plenty of great organizations where you can at least get your feet dirty and starting making cob: the Cob Cottage Company and House Alive!, both based in Oregon are two companies that regularly host workshops, internships, and work parties. There’s many a reason why cob has been around for as long as it has, and why it’s used all over the world. It’s inexpensive (economically and environmentally), beautiful, and well, quite simply “natural”. Cob is what truly “green buildings” are made of.